What is The Value of Paper Qualifications? Unfortunately, that was not a rhetorical question. It seems that in the process of moving house, I have managed to lose a box. In that missing box, there is a file. In that file, I have almost all my educational and professional qualifications. That includes my O-levels; my A-levels; my university exam transcripts; my Dean's List certificates; my Postgraduate Practical Law Course certificate; my admission to the Supreme Court of Singapore; my Capital Markets & Financial Advisory Services certificates; my CCA certificates; and my certificates for having attended various short courses. And also all the employment contracts and other documents which go towards establishing my job history over the past decade. My wife and I spent five hours yesterday trying to find the damned file/box. My children helped too. To no avail. I suspect that the file might have been accidentally thrown away, during the unpacking process. Duh! Now that the initial panic has died down, I am trying to think clearly. In the worst case scenario, the file is gone for good. But I can try to write to the relevant organisations to get the replacements for at least some of the documents. And before that, I need to try to work out a list of all the missing documents. As I am doing that, I start to realise that perhaps I've outgrown many of these documents. They may not serve any purpose any more. Why would I need any of these documents? Really - only for three possible kinds of purposes.. The first purpose is an application for emigration. The second purpose is an application for further studies. The third purpose is HR verification, if I were to accept an offer for a new job. I don't intend to do either of the first two things, anytime in the next five years. So there's no rush there. However, the third purpose is a possibility I can't ignore. Yet I doubt that any prospective employer would be interested in my O-level or my A-level certificates. Certainly, my CCA certificates would be of zero interest to them. Certificates concerning short courses and seminars I've attended over the years would also be irrelevant for their purposes. They probably do want to see my university degree (this document wasn't in the missing file, so I do have it). They will also want the formal proof that I'm an advocate and solicitor of the Supreme Court of Singapore (I should be able to reapply to get this). Once I get that proof, I probably don't need to show my Postgraduate Practical Law Course certificate. The PPLC certificate is really nothing but a stepping stone towards the advocate & solicitor status. I would like to be able to show a new employer my "Dean's List for Academic Excellence" certificates. But perhaps that's just my vanity at work. With more than a decade of working experience, such certificates, at most, would be a small plus point. I could mention these achievements in my resume, and if asked to show the documentary proof (and if I were not able to get the replacement documents), I could truthfully tell the HR department that I've lost the certificates. If necessary, I could give the HR department permission to contact NUS directly for verification. I also lost my CMFAS certificates. I'm fairly sure that I could reapply for replacements. On the other hand, I don't intend to work in any job where these qualifications are a pre-requisite. They are, at best, little extra selling points about myself, not essential. Most people holding my current kind of job don't have CMFAS qualifications anyway. In my missing file, I had a few testimonials. On the other hand, so what if I lose them and can't get the replacements? In the past 10 years, I've changed jobs several times and no one has ever asked to see any testimonials. A new employer would carry out its due diligence on me, but typically it would not rely on written testimonials. Instead it would rely on its own network to informally contact my ex-bosses and ex-colleagues, to ask questions about me - whether I was reliable, smart, a team player etc. I would also provide a prospective employer with the names of persons that it could contact, to ask questions about me. That's how the industry typically operates. It's also possible that I never change jobs again. I stay with my current employer for the next seven or eight years, and retire early (it is my ambition to retire early) and perhaps thereafter I may earn a small income trading stocks or via some kind of small, part-time business of my own. I wouldn't ever need to show any educational or professional qualifications, to do that. So what is the value of paper qualifications? Perhaps the most important purpose of a certificate is to help you get another certificate (for example, the PSLE cert helps you to get the O-level cert which helps you to get the A-level). At some point, however, the actual work experience outweighs the paper qualifications in significance, and then it seems that the certificates would cease to matter much. Let me say that again, because the statement would probably surprise some Singaporeans. At some point, the certificates do cease to matter much. A final tidbit for thought. The next time the PAP tries to portray a candidate as impressive and voteworthy because he was a scholar blah blah blah, do pause for a moment to reflect. Should we really give a hoot about the guy's exam results and CCAs, from a long, long time ago when he was 18 years old? In Singapore, exams and CCAs are what makes a scholar, a scholar. Yet why should his certificates matter that much? Perhaps we should be scrutinising his real-world experience instead. 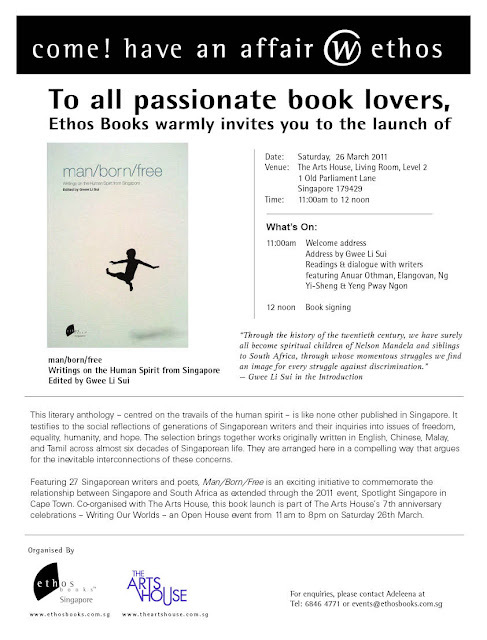 I mentioned several posts ago that I'm getting included in an anthology featuring writers from Singapore and South Africa. 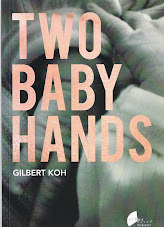 At that time, I didn't even know the title of the book, but now I do. It's Man/Born/Free, and from what I've gathered, contains political overtones and is, ahem, mildly subversive in nature. Well, my feet are aching, and so are my calves, and I think I may have cracked a rib, but the good news is .... I'm alive! We just moved out from our rented place to our new cluster house, lugging along 50 boxes and miscellaneous pieces of furniture. Moving house is always stressful, but what makes this move even more challenging is that our new place is still not quite ready. There's dust and debris everywhere, and workers keep dropping in to do more renovation. For the next two weeks or so, we will be living in the basement and one bedroom. The rest of the house is still under renovation. We have no kitchen to do any cooking (the kitchen is in the process of getting rebuilt), so for the time being, we are going to eat out and/or live on food like sandwiches, fruits and milk. At night we sleep on mattresses placed on the floor, and we are living out of boxes. I'm on leave this week, but next week I have to get back to work - and I hope to be able to find my working shoes by then. I imagine that normally, I would be quite upset about living like this. What's keeping me (relatively) sane and composed is, oddly enough, the earthquake in Japan. Thinking of the 350,000 homeless folks in Japan, plus all the others living without electricity, makes me feel quite unable to complain. It makes me feel glad for my blessings, actually. Singapore's disadvantage of a lack of natural resources is counterbalanced by its lack of natural disasters. We don't have gold, coal, steel or oil, but equally we don't have earthquakes, tsunamis, blizzards or hurricanes. All things said and done, life for the PAP government is pretty easy because they never have to deal with natural calamities such as Australia's floods, Japan's tsunami, New Zealand's earthquake or the snowstorms in New York, for example. All such events are a true test of a nation's leaders and, well, our leaders have never been tested. In fact, many of them have never even contested in an election (they just "win" by walkover). We are a nation led by "leaders" who mostly look good just on paper. I am currently reading this book - Investing the Templeton Way - which is all about Franklin Templeton (a billionaire investor and a modern legend in the investment world) and his strategies. Sir John Templeton died a few years ago, at the ripe old age of 95. He was the founder of Franklin Templeton Investments, which is one of the world's biggest players in the mutual funds industry. Investing the Templeton Way was written by Sir John Templeton's nephew, and is partly a biography, and partly a guide on investing money. The book contains many interesting personal anecdotes about Sir John Templeton, starting with his childhood, to his impoverished teenage days during the Great Depression, and ultimately to his billionaire investment decisions in the late 1990s. February wasn't a great month for me. I fell ill shortly after Chinese New Year and had the worst flu of my life. It was probably the H1N1 virus which is still running amok in Singapore. After the fever, the sore throat, the body aches and the runny nose were all over, I was left with a lingering cough that transformed itself into bronchitis. I've been coughing and wheezing and having difficulty breathing. I've been coughing so much that my ribcage is hurting.